Well heh another wally.. i think the rei ayanami was a cool wally but i like this one more and the scan aww.. i like neko's alot.. just ask K4N3 heh.. ^^.. Well i hope you like this one and i did it small version if you guys what a bigger version i'll send it to you .. just PM me heh ^^..
waii! It's really cute! The image seems so warm and fuzzy! Thanks for sharing! Well done! Great job! [: *looks around* wow, I'm the first? lol. Oh, it's so kawaii! It's a fav for sure. Great work, keep it up. Nekos are so awesome!!! very cute scan, but u know! this a ragnarok wallie u submitted! the one on the left is a wizard, the middle is a nyt, and the right is a bard! Thank you for another great wall :) Neko's !!! Kawaiii. ;) You're getting even better at doing grass. OMG !! This is so cute and the background look so lovely !! I love it !! Good work !! So adoreable !! i like it soooo much! The extraction is excellent and the bg is so nice! Keep it up!! Very cute chibi yet again. The rainbow is a nice touch but aren't rainbows usually transparent? The grass in the back look kind of weird too. 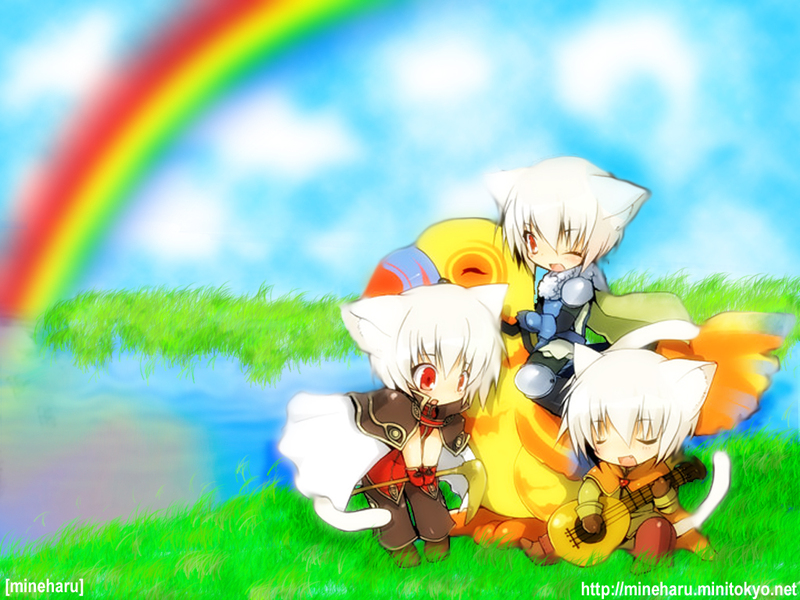 Yup it is ragnarok online! Those are characters from the game! ;) Keep up the good work! Yay! Nekos for life. The cuteness of the nekos shall take over you. Thanks for the awesome pic.